Summer is here in North America — and that means we have wild-caught fresh Alaska salmon in our markets. It’s the best-tasting salmon we’ll be able to buy all year. This seasonal delight turns any meal into a feast. And it never fails to impress, because most people think cooking fish is difficult. Almost everyone has a fish-cooking horror story. Fish fillets and steaks tend to be thin, so they cook fairly fast. That means there’s a fine line between almost raw, overcooked, and falling-apart flaky. And even if we cook the fish perfectly, the surface can sometimes get a bit too dry, particularly if we crank up the outdoor grill. Enter poaching. When you cook fish in liquid, it remains moist and luscious. And because poaching provides gentle heat, you have a bit more leeway than with other cooking methods. So if the fish is finished a few minutes before the rest of dinner, no problem. A fatty fish like salmon can stay on hold (off heat) in its cooking liquid for a good 10 minutes. And poaching is easy. If you can boil water, you can poach salmon. Really. Salmon has lots of flavor, so you can poach it in a very simple liquid. Water flavored with just salt and a bit of acid (wine or wine vinegar) works perfectly. You may have heard of elaborate fish dishes that require a court bouillon (that is, broth — often lightly flavored by vegetables). Those are great preparations, and always tasty — but you can take a simpler approach with salmon. 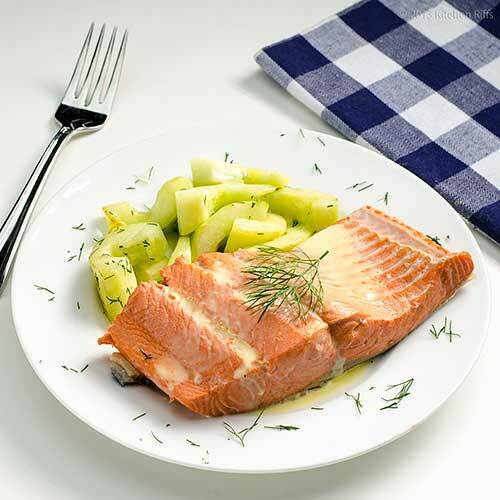 With its rich flavor, salmon doesn’t require anything more than salt and pepper (added at table) to season it. If you want to be fancy, you can add a tablespoon or so of Hollandaise Sauce to each serving — which is what I did today. Most Alaska salmon is caught in warm weather, from mid-May into September (though troll-caught king – Chinook – salmon is harvested year-around). Early in the season — right now! — king and sockeye salmon are the kinds you’ll see most often. My market was featuring Copper River sockeye, so that’s what I cooked for this post. This fish has deep red flesh and superlative flavor. It’s one of the best-tasting Alaska salmons, IMO. For poaching, I like salmon fillets that weigh 5 to 6 ounces and measure about an inch thick (maybe a bit less — sockeye salmon is smaller than other species, so steaks of ¾-inch thickness are pretty common). But you can ask your fish monger to cut fillets in any size you prefer. IMO, the most flavorful salmon has nice, pronounced fat lines. Each salmon fillet is one serving, so it’s easy to buy exactly what you need. And you can substitute steaks for fillets if you want; I just prefer fillets in this recipe. Most general cookbooks offer a recipe for poaching fish, and the recipes tend to be pretty similar. For this post, I used a recipe from Julia Child and More Company. Cooking time for this recipe is 7 to 8 minutes, maybe a little longer; plus you need to add time for the poaching liquid to come to a simmer. So figure 15 minutes, total. This recipe makes two servings, but you can adjust it to any quantity. Add the water to a wide, shallow sauté pan or saucepan that’s just large enough to hold the salmon fillets (I use an 8-inch sauté pan with sides that are 3 inches high). Bring the water to a simmer on the stovetop. Meanwhile, if your fish monger hasn’t removed the pin bones from the salmon, run your hands over all fleshy surfaces of the fillets, searching for bones. Remove them with your hands, or use tweezers or needle-nosed pliers (I use the ones from my toolbox). Return the fillets to the refrigerator until you’re ready to cook them. While the fish poaches, you can chop dill or parsley for garnish, or make Hollandaise sauce (you can also make Hollandaise ahead of time, and keep it warm while the fish poaches). When the timer goes off, turn off the heat (and if you’re cooking on an electric element, remove the cooking pan from the heat). Allow the fish to rest for a minute or two (two minutes if you like your fish cooked medium-well). If you’re not ready to serve, you can hold the fish in the water for 10 minutes or so. But note that the fish will continue to cook somewhat (from the residual heat of the water), so it may become a bit more done than you prefer (it will not be overdone, however). 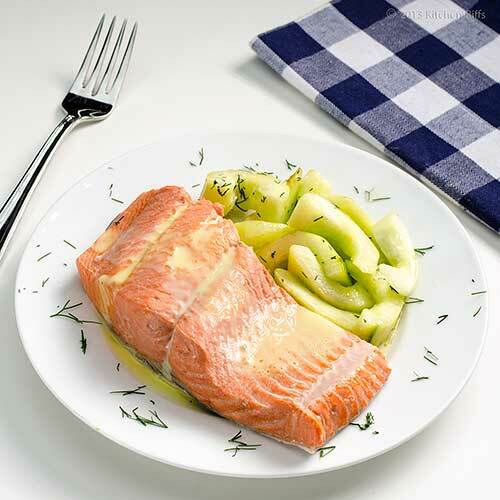 To serve the salmon, remove the fillets from the water with a wide spatula. I place them flesh side down on a towel to drain briefly (a few seconds). If you want to serve them with the skin on — I usually do — simply plate the fish, skin side down, and sprinkle on some optional chopped dill or parsley, or add a dollop or two of Hollandaise sauce. If you prefer to serve with the skin off, simply peel it away (if the skin is too hot for your fingers — very likely — use a soup spoon and a fork). Then plate the fish (with the side that had the skin facing down) and garnish. The amount of salt and vinegar specified in this recipe is appropriate for one quart of water. If you use more water (for example, if you’re poaching more fish fillets), increase these ingredients proportionally. Properly cooked salmon (i.e., medium) will be just slightly translucent at its thickest part when you cut into it. If you want well-done salmon, cook it a minute longer than this recipe specifies. BTW, even if the salmon gets a bit too done, it will still be moist and flavorful when you poach it. According to The National Oceanic and Atmospheric Administration (NOAA) FishWatch Program, shrimp is the most popular seafood in the US. Tuna is next, but much of that is canned, not fresh. Third is salmon, almost all of which is consumed fresh (making it the most popular fresh fish in the US). In the US, if you want wild (rather than farmed) salmon, you’ll most likely be buying fish caught on the West Coast. (Only a miniscule percentage of Atlantic salmon sold in the US is wild; almost all of it is farmed). About 96% of West Coast salmon comes from Alaskan waters; the rest is from Washington, Oregon, and California. King salmon is available fresh throughout the year in the US. Other species of Alaska salmon are available fresh only in the summer, but you can find frozen and canned salmon throughout the year. Frozen salmon tends to be high quality, and I buy it when I can’t get fresh. But the texture of fresh salmon tends to be a bit more consistent than that of frozen. There are five species of Alaska salmon, BTW: King, sockeye, coho, keta, and pink. My favorites are king and sockeye; they (along with coho) are great for poaching. Keta and pink salmon have less fat content (and thus a milder flavor). They poach well, but I tend to prefer them grilled. If you want to learn more about Alaskan seafood, check out this website: Wild Alaska Flavor. Father’s Day rolls around next week, so it’s time to start planning your menu. Poached Salmon would be a perfect entrée. Its rich, seasonal flavor appeals to almost everyone. Salmon would pair well with sautéed cucumbers — a recipe I’ll be sharing next Sunday — and with simple boiled or roasted potatoes. Or you could serve potato salad. French Potato Salad would go well with poached salmon, as would American (Mayonnaise) Potato Salad. So would Horseradish Potato Salad — a recipe I’ll be sharing later this month. For a starter, you might want to try Roast Strawberry Salad — it’s a great way to use fresh local strawberries. And for dessert, maybe Walnut Roll Cake. This sensational cake is special — appropriate for a special guy. If your Dad insists on meat, maybe Oven Slow-Cooked Spare Ribs would tickle his fancy. Or you could try Barbecued Pork Steaks. And there’s always that great American classic, Grilled Hamburgers. Any of these would go well with one of the potato salads mentioned above, and with slaw of some kind. You might try Jalapeño Coleslaw with Pimentón or Garlic Coleslaw. Or you could stick with the classic Creamy Cole Slaw. Another fun side dish would be Southern Green Beans with Bacon. And to drink, how about a Pimm's Cup? It’s the perfect warm-weather drink, and very refreshing. Or maybe a Mojito Cocktail or a Gin and Tonic. If Dad is a beer-loving guy, maybe serve up a Dark N’ Stormy — a great combo of ginger beer and dark rum. Need a recipe for that last one? Check back on Wednesday — it’s the next drink in our Supper Sippin’ Series! Nice post John - so thorough! We love, love, love poached Salmon - especially the Chinook. We are lucky to live in Seattle and have access to some of the freshest available. A simple poach really highlights this beautiful fish! Hi Alyssa, salmon is good no matter how you cook it, but it really shines when you poach it. How I envy you all the terrific seafood you have in Seattle! Thanks for the comment. Again, great tutorial, tips, and menu ideas. Hi Debra, glad you enjoyed it! Thanks for commenting. Hi John, great posting. 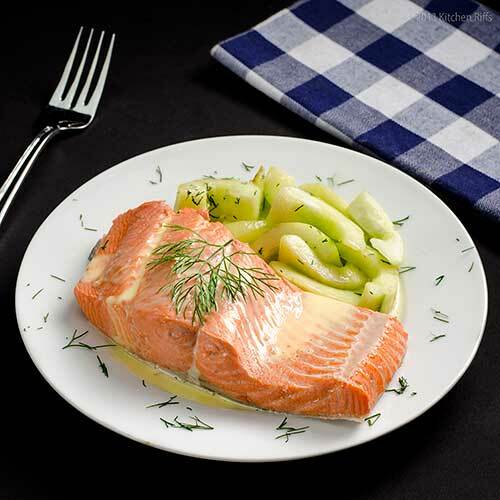 Your poached salmon certainly look appetizing and delicious. Thanks for sharing the recipe, simple but it look good. Nice plating. I love salmon just about any way you can cook it. This looks great and I love your cucumber salad with it as well. Nice and refreshing and healthy - that is unless you add the hollandaise. 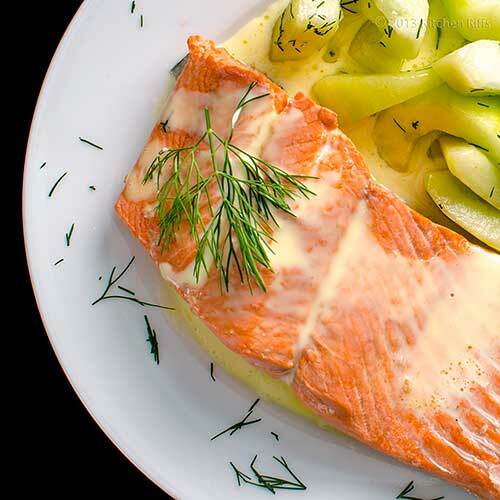 This poached salmon looks simply lovely, I bet it tastes brilliant! I think Poaching is for me. I always overcook salmon to the point of dryness.Your salmon looks perfect! Hi Amelia, this is such a flavorful dish! Hard to go wrong with salmon. Thanks for the comment. Hi Vicki, Hollandaise isn't the most healthful thing around, is it? ;-) Although a tablespoon or so isn't too bad. That's my story, and I'm sticking to it! Thanks for the comment. Hi Uru, it really is a delish dish, with incredible flavor. ;-) Thanks for the comment. Hi Charlie, although salmon is wonderful any time of the flavor, it always screams summer to me. Probably because that's when we get the really decent wild salmon in our markets. Thanks for the comment. Hi Lizzie, baking works well, but poaching is worth trying. And the cucumbers combine so well with the salmon! Thanks for the comment. Hi Peachy, you can certainly screw up cooking salmon when poaching, but it's pretty hard. And poached salmon is so moist and flavorful! Thanks for the comment. Yep, I agree you can't go wrong with salmon- nice rich, meaty taste. The Hollandaise would certainly put on a crowning touch, but I always find it a bit too much trouble with all the whisking in of the butter towards the end- I find 'beurre blanc' easier because no egg yolks are required. I'm not sure where our salmon comes from here in Australia- I'll have to ask next time! I have never had poached salmon before, sounds like a wonderful way to fix it. Salmon is one of my favorite fish to eat. Hi Fran, beurre blanc would be an excellent choice too. I actually find either one about the same difficulty (and if I'm lazy, I'll make Hollandaise in the blender - practically foolproof!). Thanks for the comment. Hi Dawn, I think you'll enjoy poaching salmon - so easy, and it cooks so well. Thanks for the comment. Hi Barb, poaching really is a nice technique to use when cooking fish. Not as intuitive as slapping a fish fillet on the grill (or in a frying pan), but it works quite well. Thanks for the comment. Thank you for the love story! Anyone who feels they are a foodie surely has this as one of their top six . . . I'll have the wild one rather than the farmed, I'll use white wine and dill and feel I am lucky to be alive . . . one of the most perfect [tautology, I know!] dishes I know . . . I may share with your permission . . . I never knew how to poach salmon!! I really know nothing about cooking fish at all. Thanks for all the tips!! What a classic way to cook salmon. And it is always a winner. Add the hollandaise, please! Hi Eha, share away! I agree this is one of the best dishes out there. And yes, every time I eat it I feel as if I'm lucky to be alive! Thanks for the comment. Hi Amy, white fleshed fish is wonderful poached! I usually use a court bouillon with them - they can benefit from the extra flavor. You really should try it with salmon - so delish! Thanks for the comment. Hi Ashley, poaching fish is a great way to learn how to cook it - it's pretty forgiving. Enjoy! Thanks for the comment. Hi Maureen, glad to contribute to the Queen's celebration! Thanks for the kind words, and the comment. Hi Abbe, the Hollandaise adds quite a bit, doesn't it? ;-) Thanks for the comment. Hi Suborna, I take it that you enjoyed the post? ;-) Thanks for your kind words, and comment. I just recently found that my tastes have changed and I like fish, but I still haven't tried salmon. I would totally eat that though, although to be fair it is covered in hollandaise. Heh. Simple and lovely recipe, I need to buy a salmon now. Hi Bob, salmon is well worth trying. Heck, anything with Hollandaise is worth trying! Thanks for the comment. Hi Marta, you definitely need to buy some salmon! It's pretty good for breakfast, too. ;-) Thanks for the comment. King, sockeye, and coho salmons are my fave! I only eat wild salmon and eat it at least 2 times a week year round. I have a good market near my house that stocks amazing fresh salmon in the summer and frozen in the winter. I have always wanted to try it poached but it seemed a little intimidating. you have made it seem so simple and I can't wait to try it. Would it be okay to remove the skin prior to cooking? I love salmon skin and would like to bake it separately. Hi Laura, you could try removing the skin, although it does help hold the flesh of the fillet together. It might be worth trying to poach it with the skin, then when you remove the fillets, remove the skin and pan fry it quickly to crisp it up (it's pretty flabby from poaching). Thanks for the comment. This is a great post, John. I've never poached any fish and have a recipe for fish poached in olive oil I've wanted to try. First, though, I think I'll give your recipe a try. It sounds delicious, especially with a bit of Hollandaise on top. That would make a great dinner whether alone or serving guests. Thanks for writing such a thorough how-to post. There was a time when the DNR stocked the creek behind my family's property with coho fry every year. It was an amazing thing to live in the Midwest and have access to freshly caught salmon. The stocking program was stopped in the 80's, a victim of budget cuts. With California King salmon in season, I have been buying a ton of it. Worth the splurge, especially for dishes like this that don't obscure it's wonderful flavor. Hi John, I've eaten fish poached in olive oil. Quite good, but I'm never made it - I want to someday. Too bad about the stocking being stopped! Freshly caught salmon must have been quite a treat. Thanks for the comment. Hi Carolyn, fresh salmon is almost always a splurge, but I agree it's so worth it. And salmon is so flavorful, you really don't need to dress it up much (if any) in order to have a treat. Thanks for the comment. I couldn't agree more: wild caught fresh Salmon is the best. Love the idea of poaching the Salmon-it's so much lighter that way. Is this cucumber you serve together with the Salmon and the Hollandaise? Excellent choice! Hi Liz, it helps to use sockeye salmon - it has such a gorgeous color! But this really is a recipe worth trying - I find most people like it. Thanks for the comment. Hi Daniela, yup, I served cucumber with the salmon - such a great combo. And wild salmon is wonderful! ;-) Thanks for the comment. Hi Ala, salmon is a super food, isn't it? Maybe you can make some salmon sweets. ;-) Thanks for the comment. The salmon looks perfect John! Gorgeous colour and looks so moist. I have never poached any fish at home but you make it sound so easy that I will have to try it. Lovely with a bit of Hollandaise on top. I love poached salmon! This is such a tasty and enjoyable dish. I love poaching fish, it has to be the easiest way of cooking it. How lucky are you to have fresh wild Alaska salmon available! I love wild caught salmon. Poaching is such a lovely way to prepare salmon and your dish looks really tasty! Til this day I can still remember the first time I had poached Salmon, John and to be honest, it wasn't all that long ago:) It was on the eastern shore of Long Island and it was heavenly! Can salmon be heavenly? Well, it was! Hi Nazneen, poaching is so easy! And an excellent way to cook fish - it remains so moist. Thanks for the comment. Hi Rosa, isn't poached salmon so great? My favorite way of cooking it. Thanks for the comment. Hi Gourmantine, we are lucky to have easy access to fresh wild Alaska salmon! Not cheap, but so worth it. Thanks for the comment. Hi Amy, isn't wild salmon so wonderful? I could eat it every meal (if I could afford it!). Thanks for the comment. Hi Bam, salmon is a great fish for poaching! As you say, it has such great flavor the poaching liquid doesn't need to add any - so it's a simple recipe. Thanks for the comment. Hi Louise, smoked salmon is wonderful. I'm playing around with a recipe that uses that. ;-) And the Dark and Stormy is a fun drink! Thanks for the comment. I've never poached salmon and my lovely dill plant has been just waiting patiently for a delicious recipe, here it is! Thanks! Hi Chris, I think your dill plant has just found its new best friend! Enjoy. ;-) Thanks for the comment. I have never poached salmon...after reading your post I think I could give this technique a try...simple and so elegant John...I love the color of the salmon. Hi Juliana, poaching fish is easy, and it's particularly rewarding to do so with salmon because of its great flavor. Well worth trying! I'm having a great week, and hope the same is true for you. ;-) Thanks for the comment. I love salmon! It's best when cookied simple, just like in your recipe! Hi Julia, isn't salmon wonderful? And I like it cooked any way, but poaching is particularly nice. And easy! Thanks for the comment. I'm breaking the bank right now buying Copper River Salmon from Alaska, but it's worth it when I can find it. I've never poached salmon because I've never seen a fillet look as beautiful as the one you have here. Your pictures have convinced me that it is something that I should definitely give a try. My friend SuAnne was telling me this week that the frozen wild salmon is worth buying and now you. I guess I need to check it out. I've never been a fan of the texture of frozen fish, but sometimes I can't find fresh. Great post John! Hi MJ, the frozen Alaskan salmon isn't quite as good quality as the fresh (that texture thing, although not nearly as bad as with some other frozen fish, and sometimes the texture is just fine) but I think it's more than acceptable. Poaching is work doing - it's so simple, and great when you're juggling a couple of different dishes and can't be spot-on with your timing. Enjoy! Thanks for the comment. What perfect timing. My dad LOVES salmon, but I'm always hesitant to make it. I need a fool-proof recipe and this seems to be it! I imagine it is super moist too! Thank you for sharing. Now to go visit the fish monger! Hi Monet, this really is a fool-proof recipe. It's very forgiving in timing - you can let the salmon sit in water for a few minutes after it's cooked without worry that it'll overcook too much or will dry out (it'll become more well done, but not really overdone as long as the pot of off heat and the fish doesn't sit there for more than 10 minutes or so). Have fun! Thanks for the comment. I have a love/hate relationship with salmon. I'd love to like it, but hate to say that I don't. It is so beautiful and good for you, but there is just something about it that I am not fond of. That said, I continue to try it thinking one day my tastes will change. I will definitely give this recipe a try. Maybe this will be the one. I know my husband will adore it. I know I sound like a broken record, but your photos are just beeeeuuuutiful! I have never poached salmon before so thanks for this! Can't wait to give it a try. Hi Karen, the only downside with salmon flavor-wise is that it's a somewhat oily fish, and some people just find the mouth fell of oily fish distasteful (even if they're OK with the flavor). You can always use lots of Hollandaise! You might also ask your wine merchant for a recommendation of what to drink with salmon (I'm thinking something with a fair amount of acid to it). Sometimes once you pair a food with a wine that really goes well with it, you discover things in the food itself that you hadn't noticed before. Thanks for the kind words, and comment. Hi Natalie, poaching fish is fun, easy, and tasty! Good stuff, I'd say. ;-) Thanks for the comment. Hi Kiran, poaching fish is a really good technique to know - I love the texture and juiciness of the fish. Thanks for the comment. Hi Helen, poaching is such a great way to cook almost any fish (although for the mild flavored ones you want a flavorful broth as a cooking liquid - something not needed for salmon). Glad you hear you finally got the hang of frying mackerel to pass your husband's taste test! Thanks for the comment. We eat salmon all the time and it's nice to see your poached salmon. I usually eat raw (I mean salmon sashimi) or grill/panfried it. It's good to add to my boring list of salmon recipes! Hi Nami, poaching is fun! And so easy to learn. Salmon is such a great fish, I'll eat it no matter how it's prepared! Thanks for the comment. I love salmon paired with dill! Always reminds me of summertime. What a great way to enjoy salmon! It's my favourite fish, although I usually grill it. This is a nice alternative to consider. Hi Irina, dill and salmon is a magical combo, isn't it? And it reminds me of summer too! Thanks for the comment. Hi Beth, I love salmon grilled, too. Heck, I'll eat it any way someone wants to prepare it! Thanks for the comment. Hey daddy bear... this salmon sounds scrumptious! Hi Lizzy, ;-) It's really wonderful! We've been gorging on salmon lately! Thanks for the comment. I had some poached salmon last week and it was so good, I never tried to use poaching method in salmon and looks like that had just changed. That method effectively locks the flavours of that fish. Hi Raymund, poaching salmon really works - it's worth doing. Salmon is good no matter how you cook it, but poaching is easy and fun. ;-) Thanks for the comment. I love salmon in so many ways, smoked, fried, baked and poached. I love that you served this with hollandaise - what a delicious idea! Hi Christine, isn't salmon a versatile fish? Every way I've prepared it, it's been wonderful! Thanks for the comment. Fantastic instructional John! It's been a long time since I've poached salmon. The last time was in vege stock with herbs and a splash of white wine... so good. I don't know why I don't do it more often (thanks for the reminder that pan-frying shouldn't always be the default!). Do you make your own hollandaise? I've only attempted it once (though I do make mayonnaise occasionally). Your dish looks absolutely delicious! Hi Laura, I do indeed make my own Hollandaise. When I'm in a hurry, I'll do it in the blender - practically foolproof. Although it tastes a bit better when made by hand. And poaching is such a great way to cook any kind of fish! Thanks for the comment. I love wild-caught fresh Alaskan salmon. I find myself waiting for it as the warm weather approaches. And you bet I'm first in line to get my hands of some. I've prepared it so many different ways, but never poaching. I find poaching seafood quite intimidating. But I will now have to try poaching before the summer ends. Thanks for demystifying the process! Hi Gomo, poaching is really a nice way to cook fish - hard to mess it up. And it's really easy! Definitely worth trying sometime. Thanks for the comment.